This segment is about making your own mini personal survival kit from items you may already have on hand. I will be using an Altoid candy tin that I save as my container due to its compact size. They fit perfectly in a back pocket or jacket pocket or even a purse. The container should be sturdy and be made water tight. Your choice of items should able to perform more than one function, if possible. This saves room to carry more items in your kit. Choose items that are durable. Remember, you get what you pay for. Your life depends on the strength of your equipment. My mini kit contains the following items with a short explanation of each. The video left out the fishing hooks and sinkers and a few other things that I added later. This kit was made for use in the Southwestern parts of the United States, but can be used anywhere. If you know you will be traveling to a tropical place, you may want to design a kit specific for that area. 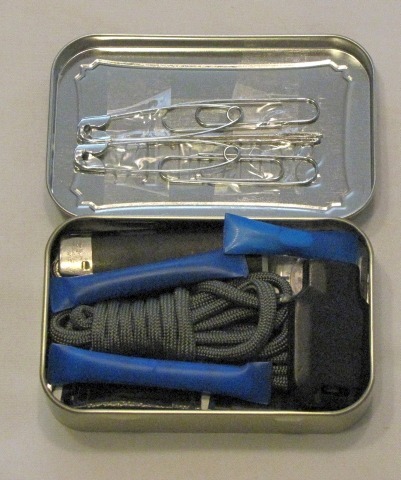 Altoid Tin- holds your items. Can be used to make charcloth or a tinder box for starting fires. Can boil water and cook food. Note Paper- to make maps or leave notes behind for rescuers; also for fire starting. Pencil/Pen- to leave messages (you can burn the end of a twig and make your own pencil by using the black charcoal end. Lighter- for fire starting; water purification; cooking food. Fresnel Lens- for fire starting; locating splinters. Small Knife or razor blade- for cutting; for shelter making; fire starting; weapon making; trap making; medical needs. Duct Tape- for shelter needs; medical uses; weapons making; clothing and equipment repairs; fire starting. Electrical Tape- same as Duct Tape. Para-cord (4 feet)- for shelter making; hunting; traps; fishing; sewing; weapons. Ferrous Flint Rod- fire starting. Arrow Heads- for hunting and fishing; protection. Rubber Band or Ranger Band- for securing survival kit; making weapons; medical needs. Safety Pins (2)- Mending clothing; medical needs; fishing. Large Paper Clips (2)- trap making; lock picking; tool/equipment repairs. Aluminum Foil (18 inches length)- cooking; containers; signaling; fishing. 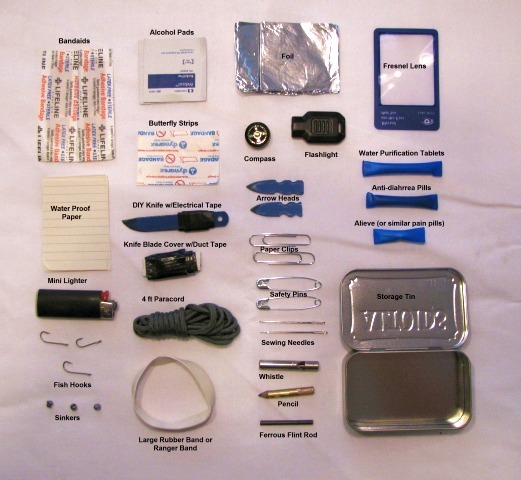 This list is a lot of items that fit within the Altoid container. And as you can see, each item has more than one use. There may be more uses than are listed here. Practice using your kit items so that when the need arises, you will already be familiar with their uses. Remember, knowledge is power. The saying goes, "that with more survival training and knowledge you have, the less survival items you may have to carry". For example, I can start a fire with rubbing two sticks together. So, basically, I have less need for a lighter or fire starter in my kit if I can expertly start a fire without them. But, I would rather have the lighter or match to make things faster. 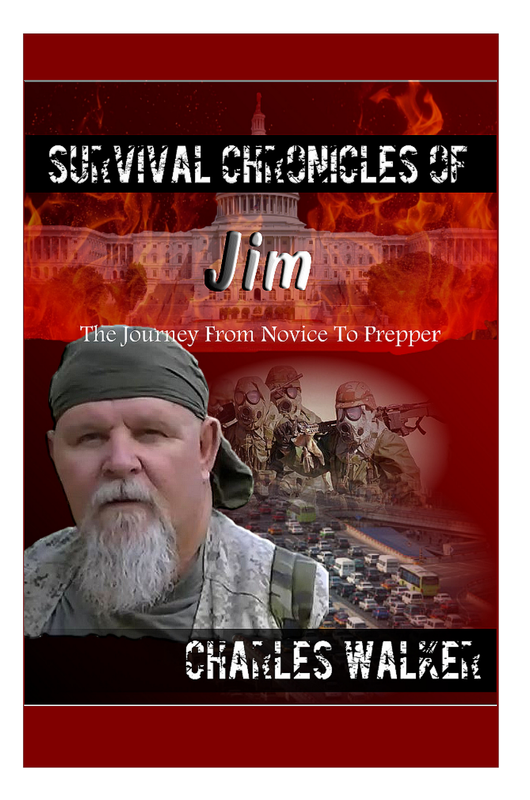 Strive to learn more about basic wilderness survival. Your life and the life of a loved one or friend may depend on it.